Lincoln Log Cabin offers education programs geared toward all ages. Our most popular programs are the Fifth Grade Live-In Program, the Summer Youth Interpreters Program, Pioneer Day Camp, and our Traveling Educational Kits. The Young Adult interpreters Program offers an opportunity for 12-16 year-olds to participate in the interpretive program on the farm. Participants engage in daily chores, such as cooking, gardening, splitting rails, mucking barns, and wheat harvesting. 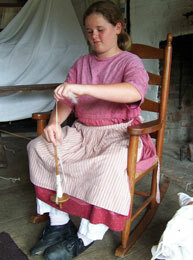 Period crafts and games provide an afternoon break from the day-to-day activities required to maintain a period farm. The program typically begins in early June and lasts for 10 weeks, participants volunteer for one day a week from 9:30 am to 4:30 pm. Registration is $40 per child. Pioneer Day Camp offers children ages 8-13 the chance to enjoy age--appropriate educational and recreational activities such as historical interpretation, hands-on demonstrations, crafts, and games – all based on the 1840s time period and using tools and techniques of that time. Each camp will have a maximum of 12 participants to ensure individualized attention and learning opportunities. Session I, June 10-14- Trailblazers: This week will offer the experiences you've come to know and love in previous years. Activities will include food preparation, arts and crafts, and historical games. Session II, June 24-28- Cast Iron Chefs: We will dive into the world of historical food preparation and preservation. Activities include building and using an earthen oven, cooking, and enjoying lots of tasty food. Session III, July 8-12- Trailblazers II: This week will offer the experiences you've come to know and love in previous years. Activities will include food preparation, arts and crafts, and historical games. Session IV, July 23-27- Full STEAM Ahead: Join us for a week of Science, Technology, Engineering, and Math (STEM) 19th-century style! Activities will include historical interpretation, exploring Lincoln's life, cabin, flatboats, and what technologies he would have used. We will also explore the fine and performing arts of the 19th century. Activities will include fiber arts, period songs and dances, and hands-on projects: Registration is $50 per child per session. The Fifth Grade Program enables students to be transported back in time to the year 1845. The girls wear dresses and aprons while the boys don 1840s shirts. They go about their day performing duties and chores typical on an 1840s farm. The girls prepare the meal while the boys muck barns, tend to crops, and saw wood. These class visits are scheduled in the months of September, October, April and May; teachers need to contact the site to schedule their class visit by e-mailing education@lincolnlogcabin.org. Traveling Educational Kits are available for teachers to borrow for classroom use. These lesson plans and teacher resources were created to accompany the four Lincoln’s Legacy Learning Kits developed by the Abraham Lincoln Presidential Library and Museum Education Division to mark the bicentennial celebration of Lincoln’s birth. The kits contain multiple copies of age appropriate books, reproduction documents, artifacts and photos, music CDs, and videos. Lincoln’s Legacy Learning Kits include: the “Abraham Lincoln Biography Kit” the “Mary Lincoln Kit;” a “Civil War Soldier Kit;” and “Slavery in Illinois Kit.” These self-contained kits are designed for use in grades 5 through 8 but can be adapted to suit both older and younger students. Each kit contains the “Lincoln’s Legacy Lesson Plans and Teacher Resource Guide CD (including lesson plans and activities), primary source material (including images, documents, newspapers, reproduction artifacts, etc. ), music, videos and other items. Please see the lesson plans in the menu on the right. Call or e-mail to reserve and receive further details on these exciting new educational materials, 217.345.1845, ext. 4 or education@lincolnlogcabin.org. Fifth-grade teachers will want to download this lesson plan to be used in conjunction with their class visit. Please click here to download a pdf document. Please click on the subject title to access the lesson plans for the Abraham Lincoln Presidential Library and Museum educational kits. All of the lesson plans are also included on a CD in each kit. Please read the Library's introduction and information on copyright issues here.